Photo caption: Andre Gray (l), Banking Executive and Founder & President of the Age Quod Agis Sports Alumni Association (SAA) presents Jaheem Rose (3rd right), Captain of the Wolmer's Under-14 football team with the organisation's contribution of $250,000 towards their nutrition programme. Sharing in the moment are (from left) Lissant Mitchell (l), CEO of Scotia Investments Ltd and local representative of the association, Lincoln McIntyre, Chairman of the Wolmer's School Board, Mikhail Meggs, Captain of the Wolmer's Under-16 football team, David Laylor, Coach of the Wolmer's Under-14 team and Rudolph Spied, Technical Director of the Wolmer's Boys Football Programme. The Age Quod Agis Sports Alumni Association (SAA) has donated $1m since 2012 to the nutrition programme for the junior football teams. 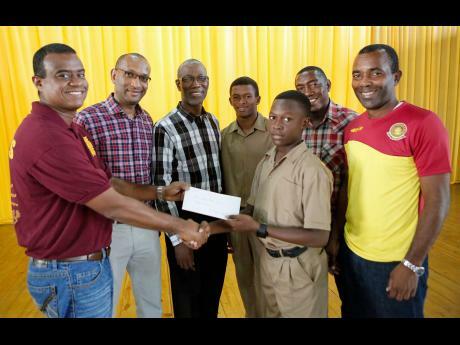 The Wolmer's Boys' School Junior Football Programme has again benefited from a major donation from the Age Quod Agis Sports Alumni Association (SAA) - an association that represents former football players from the school. On November 11, Andre Gray, banking executive and the organisation's founder and president Lissant Mitchell, CEO of Scotia Investments Ltd; and the body's local representative, presented a cheque for just over $250,000 to the school, which brings to $1million the amount donated since 2012 by the 'old boys' body. Gray, now based in Florida, commented on the effort saying, "Each year, we try to raise funds to support the junior programme because it is our view that funding at this level is often insufficient to support the numerous expenses associated with grooming the young players. It is also because of the special role that the junior programme played in our overall development while we were at Wolmer's that we feel compelled to offer our support ." The group of over 60 members graduated from the institution between 1985 and 1989 and represents a large group of loyal Wolmerians living in Jamaica, the USA, England and Canada. Thirty years ago, several of its members also won the Under-16 Colts and all-island football competitions and have maintained strong bonds since then. "The association has also noted the need for additional equipment in the Sports Department and we are now actively exploring opportunities to contribute critical items that will benefit participants in other sporting disciplines as well," Gray added. Since 2012, the Age Quod Agis SAA has staged an annual reunion and fundraiser match on the second weekend in September that helps to fund the nutrition programme for the under-14 and under-16 football teams.